What are loop times and how to create them? A loop time is defined as a period of time at which a service worker such as a cleaner or guard must visit a specific location within a property. For example, in a shopping mall, bathrooms might have a loop time of 30 minutes which means a cleaner must visit the bathroom every 30 minutes during service hours. Loop times are closely related to reducing liability associated with slip and fall related claims in public spaces. Property owners require cleaning companies to adhere to loop times in order to reduce the chance of a customer slipping over on a spill and taking legal action against the property owner. The theory goes that if a cleaner more regularly inspects an area then can eliminate slip risks and therefore reduce the number of claims against the property owner. If a slip and fall claim arises and the cleaning company is not compliant with their prescribed loop times there is a chance they could share some or all of the liability and associated costs. Even if Slip and Fall is not a primary concern, loop times can be useful for monitoring service levels and driving accountability. For example, loop times can be used for monitoring Security patrol rounds or Cleaning service levels. If a zone is not visited in the prescribed loop, a Push Alert can be sent to users notifying them of the missed service. Users that set-up loop times typically see immediate improvement in compliance to service requirements. Lighthouse reports on exception count and duration for all zones that have a loop time assigned to them. This data should allow the service provider to improve compliance with loop times and therefore reduce risk and associated costs. Click the 'New Loop’ button on the right. 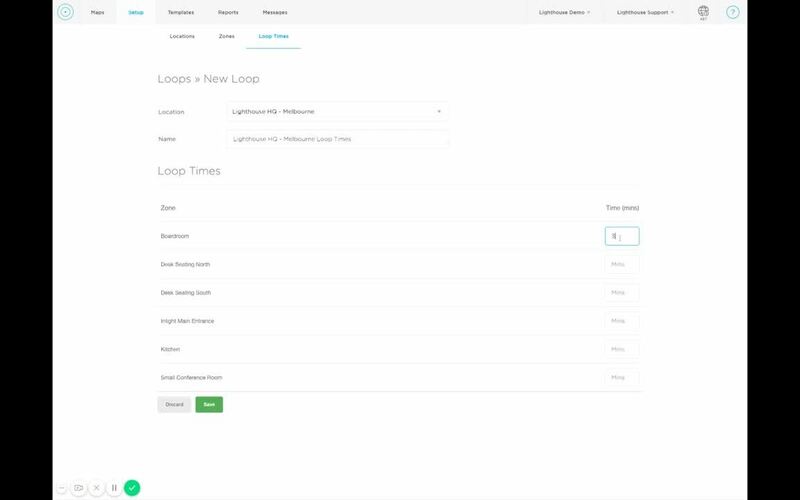 For any questions in relation to Loop Times, feel free to e-mail support@lighthouse.io or speak to your Customer Success Manager.